A second teapot acquired and this for only £3.19. 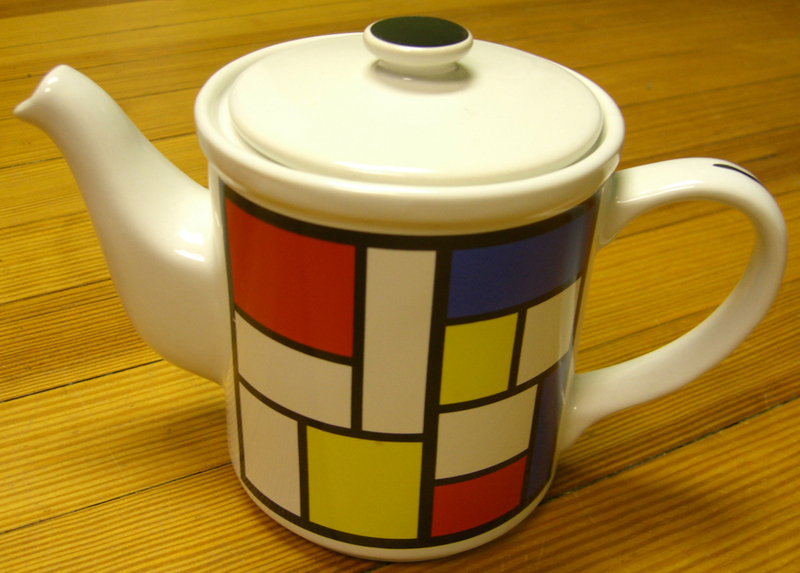 Entirely different from the perfectly-formed teapot bought in 2001 at considerably greater expense (see below), it is just as attractive in its own way. 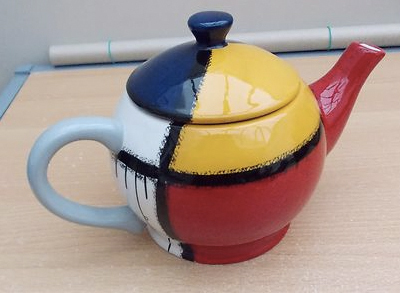 A teapot from Taiwan, selling on ebay for £60. The influence is clear, but they could at least try and spell the name correctly. The maker is described as "12580-CK LTD Taiwan" which isn't far from CBK who made the jug below (very similar design) and the picture frame. I was not tempted to bid. I missed the end of an auction for a pair of these at £6ish in September 2011. 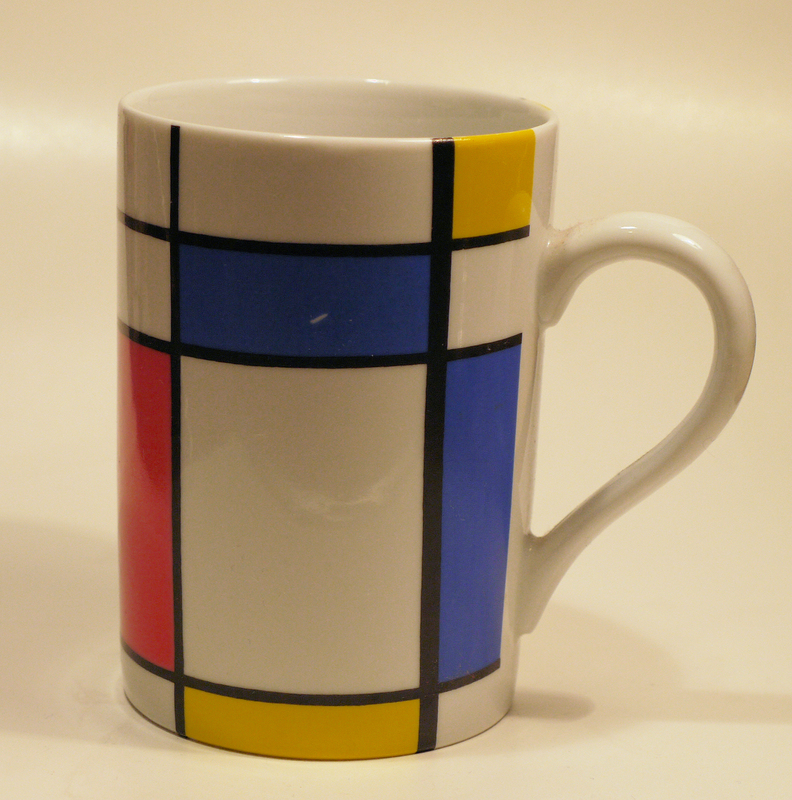 One of four mugs, rather over-priced on eBay. Nice [although more TvD than PM], but not worth the price asked. 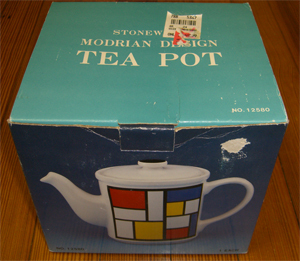 THESE FOUR ANGULAR MUGS ARE IN THEIR ORIGINAL SHIPPING BOX MARKED "A/#231 4PCS JAPAN" THIS IS HALF OF, FROM WHAT I LEARN IS A SET OF EIGHT DESIGNS MARKETED IN THE EARLY 80'S. 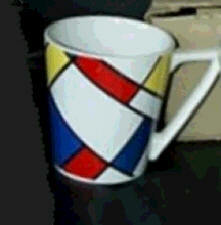 SEE MY RELATED AUCTION FOR THE OTHER 4 MUGS. All still have the original sticker on the bottom reading "Vandor c 1980 MADE IN JAPAN". All in great condition and seemingly never used,they are a great period piece. 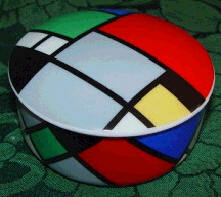 Designed in 1980 and marketed for just a few short years to mix 'n match with the styles of the new wave Memphis craze. The second was one of the best finds in The Collection, 20p in a Cotgrave charity shop. (22nd Apr 2002) I have recently discovered what this Cow Parade thing is all about. 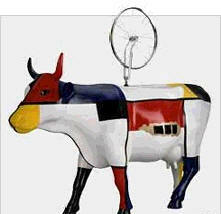 There are good and bad cows with marvellous and terrible names. There also seem to be two makers of these things, and those which are readily available do not include Moondrian and Broadway Boogie Woogie. This is a shame, as I would really like to get hold of these. 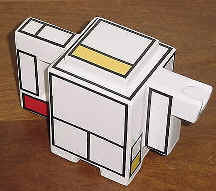 The third is Mooma, which is generally available. 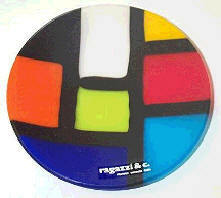 EAMES/MOD/50s/60s ABSTRACT CERAMIC TRAY/MAT AWSOME [sic]! 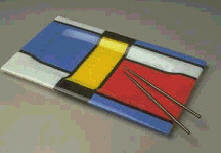 NO RES This ceramic tray is awsome [as above]! 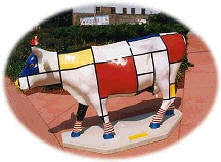 Inspired by Mondrian and the Modern, it shows an irregular combination of red, yellow, brown and black rectangles with thick black, somewhat sketchy, outlines. 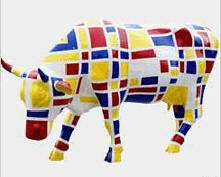 The result is very successful and highly decorative. 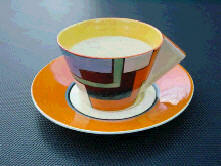 The ceramic work is inserted in an elegant medium brown wood. Was used, and has a number of specks and crazing due to heat. Overall in good condition. 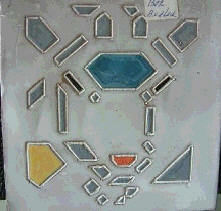 This set includes 6 hand-painted tiles. 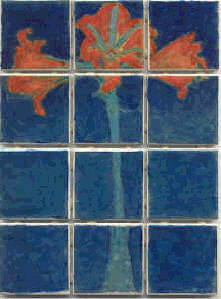 The ceramic tiles are 2x2"
Paint has been heat set and has a durable, high-gloss permanent finish. Tiles are bright and fun. 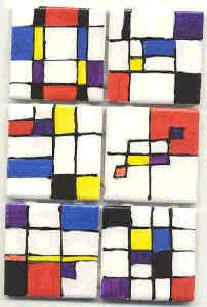 When cut into small squares these make a very interesting pattern. Recommend sand-free grout. I bought 2 sets from Roberta - here's the second, painted at my suggestion. They are excellent products. Unfortunately, the link to Roberta's site has died. Dawn Oakford - Artist's Statement. In 1988, after a period of eight years as an art teacher, I returned to Hobart to embark on post graduate studies at the Centre for the Arts. On this my second visit I wished to add to that valuable grounding by learning adifferent, more industry-based technique - that of slip casting. 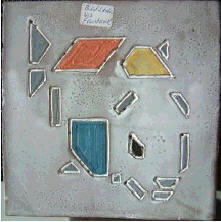 I enjoy the faceted and asymmetrical forms that slip casting enables me to produce. The angular, geometric shapes that I prefer derive from my fascination with the work of the Futurists, and the Expressionists, particularly Franz Marc. 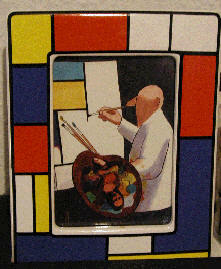 This tile is by a one-time fellow-member of De Stijl. 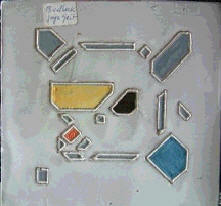 This week we have four DUTCH tiles at auction designed by Bart van der Leck age and period unknown but in a good condition and designed by one of the famous Dutch Artists who worked in the De Stijl movement like mondriaan and Rietveld one of the great examples's of the Dutch ART in the past century. See also the other one's we have as sayed four different one's. The shipping is for one $ 17 and every one more a additional $ 5. 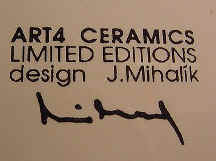 I was going to bid, but my favourite sold for $250 - that's several months' budget for the Collection. So it goes. 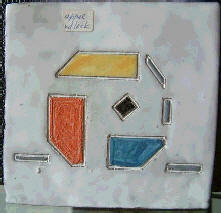 Here are the other three tiles. I nearly bought this, but $20 is over the top. 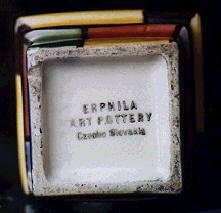 This is a wonderfully unique paperweight from the collection of Piero Ragazzi. 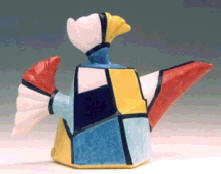 His work is characterized by the shape, design, and color of the piece, which is modern in its look and feel, yet created using the ancient techniques of a master who follows the age-old culture and tradition of Murano Glass "par excellence". 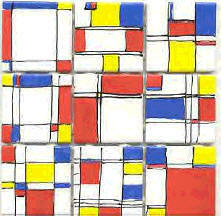 Ragazzi drew his inspiration for this piece from the work of the modern artist Piet Mondrian. 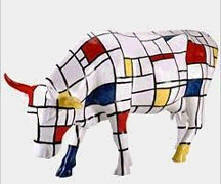 It is simply fantastic, and is sure to delight the serious collector of Murano Glass and fine glass artwork! This beautiful piece measures 3.75" in diameter, and is in excellent condition. 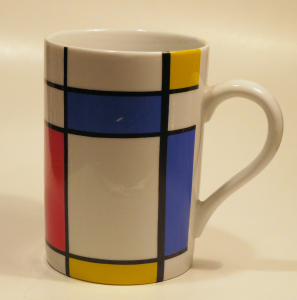 These keep popping up on eBay described a "Mondrian" and selling for £50. Can't understand why on either point. 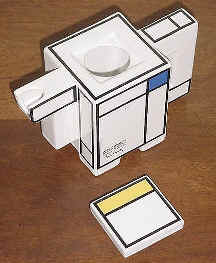 This is rather better, on eBay for a mere $1,000. 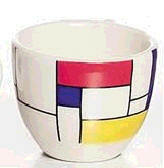 A VERY RARE FIND, A CONICAL CUP AND SAUCER FROM A TEA FOR TWO SET IN MINT PERFECT CONDITION IN THE RARE PATTERN - MONDRIAN. 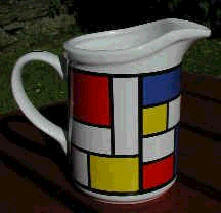 NO CHIPS, SCRATCHES, MARKS, RESTORATION OR OVERPAINTING GUARANTEED. FANTASQUE AND BIZARRE MARKS FOR BOTH PIECES TO THE BASE. This, by contrast, is nearly a thing of beauty. Shame about the green. 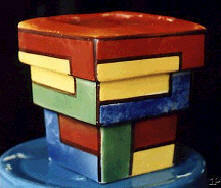 4 INCH TALL ERPHILA ART POTTERY FLOWER POT. CZECHESLOVAKIA. HAND APPLIED GLAZE IN PIET MONDRIAN STYLE. ART DECO ERA. NUMBER 2662 IMPRESSED INTO BOTTOM. CHIPPED IN 2 SPOTS UNDER CORNERS BARELY NOTICEABLE. VERY FINE VERTICAL HAIRLINE CRACK APPROXIMATELY 1.5" STARTING FROM TOP. STILL A VERY REPRESENTATIVE PIECE FROM THE ERA. GREAT COLORS.